For many the Sepulchral Chapel is the most romantic place in Wurttemberg, designed by the court builder Giovanni Salucci and completed in 1824, the beautiful chapel was commissioned by King Wilhelm 1 in memory of his late wife Katharina. This even did eliminate the ruins of the castle of the royal family of Wurttemberg to have space. The picturesque vineyard location offers spectacular views over Stuttgart and its surroundings. 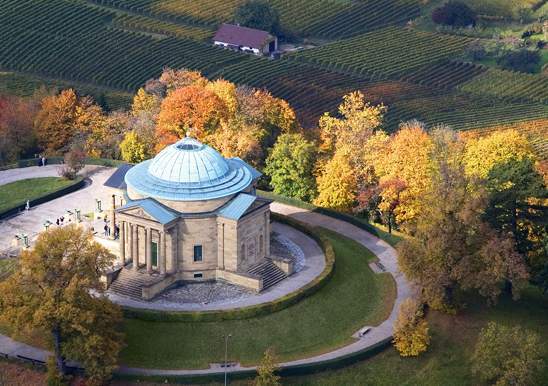 It is located on the top of a hill with the name of Wuttemberg, surrounded by the vineyards of the city, is one of the most romantic places, visible from afar, the mausoleum was built by King William and built in the years 1820 to 1824 as a memory of his beloved wife, Queen Catharina, who died at a very young age. Now the king rests on par, besides Carlota his daughter, also rests in peace in this place, from this beautiful chapel you can observe with magnificence a panoramic view of the city and its vineyards that adorn the slopes of its hills, perfect place to a walk outdoors. One of the best views in a very nice, quiet and romantic place for couples, around trails within vineyards. Tuesday, Saturday 10 a.m. to 5 p.m.